These are a great fit for Sanke kegs. Construction is all 304 stainless. The perforated disc is 3/32 on 5/32 16ga 304 with two piano hinges for easy installation. 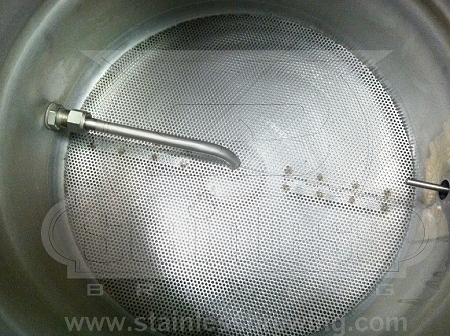 Ordered this for a converted-keg mash tun, and just got to use it for the first time. Worked perfectly! Quality is great, hinges open and close easily, fits just right into the bottom of the keg. Minor complaint was that it came with some machine oil and metal dust on it, so had to give it a scrub before using. Works great! I have no complaint whatsoever. I bought this false bottom and has worked great fits the bottom of the keggle like a glove combined with the 2" support I couldn't be happier.